The Scottish Parliament has published a new sexual harassment policy aimed at stamping out sexist and inappropriate behaviour at Holyrood and beyond. In 2018, a survey found that one in five parliamentary staff had experienced harassment or sexism. This was part of a review launched amid the #MeToo movement and high-profile complaints at Holyrood and Westminster. The new policy sets out a "zero tolerance approach" for the parliament in dealing with inappropriate actions. It sets out precise definitions and examples of behaviour which will not be tolerated, ranging from "looks, leers, comments or gestures of a sexual nature" to "unwanted physical contact". A joint letter from presiding officer Ken Macintosh and chief executive Sir Paul Grice told staff that the new policy was designed to "create an environment free from sexual harassment and sexist behaviours". Both the parliamentary authorities and Holyrood's standards committee launched inquiries after the #MeToo movement led to claims of a "catalogue of abuse" at the parliament. One MSP, Mark McDonald, quit first as a government minister and then from the SNP after admitting sending an "inappropriate" text message to a woman, and was later suspended from the parliament for a month without pay. 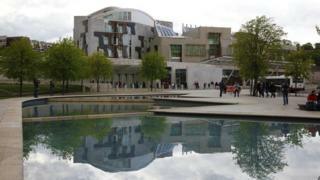 The parliament set up a confidential reporting phone line, and commissioned a survey of all staff who use the Holyrood building, which more than 1,000 people took part in. One fifth of staff - including one in three women - said they had experienced harassment or sexist behaviour, with those responsible for such behaviour "predominantly male and in a position of authority over those experiencing it". The new policy document is aimed at everyone who works at the Scottish Parliament, as well as in MSPs' regional and constituency offices. Pledging a "zero tolerance approach", it says the authorities will take complaints seriously and deal with them sensitively, maintain confidentiality within the complaints process, and ensure there are "consequences" including disciplinary action for those who break the rules. Using different language to describe people depending on gender - such as saying a man is "decisive", but a woman is "aggressive"
The letter to staff from Mr Macintosh and Mr Grice also set out plans for a new "independent support service", including a confidential helpline, access to trained counsellors, and a central point for making formal complaints. They said: "Launching the policy and support service is of course not the end of the process. We need to make sure the new processes are working effectively and, importantly, how the change in culture and attitudes is being embedded." They said the welcomed support from staff in "helping to prevent sexual harassment from happening, and in ensuring the Scottish Parliament is a safe, respectful and welcoming environment for all who work here". The new policy was welcomed by MSPs, with Labour's Pauline McNeill saying it was "an important step forward" which "sends a clear message that sexual harassment is never acceptable". Scottish Lib Dem leader Willie Rennie said there should be "serious sanctions for people who behaviour inappropriately and a route map for how to sack MSPs in cases of proven misconduct".